“The Real Taiwan and the Dutch: Traveling Notes from the Netherlands Representative” was published in April of 2010. It describes the shared Taiwanese and Dutch history with a focus on the 17th century rule of Taiwan by the Dutch. However, this is not a history book or an academic text. It introduces places where the Dutch traveled and interacted with the local people, as described in historical documents from the Dutch East India Company. In addition, the authors explore stories of interactions between the Dutch and indigenous people that appear in the oral histories of a number of tribes. Places to stay and eat and surrounding attractions are also introduced. Thus, this is really a travel guide to “the real Taiwan”, meaning areas that lie off the beaten path but that are worth exploring for their culture, historical value and natural beauty, not to mention the friendliness of the people. “The Real Taiwan and the Dutch” is also available in a Mandarin Chinese (complex characters) version. 271 pages. Published by Taiwan Interminds Publishing Inc.
Menno Goedhart worked as a production manager in a chemical factory after earning a Master’s degree in Organic Chemistry. He changed his career drastically by entering the Netherlands Ministry of Economic Affairs and now he has more than 30 years of experience in Foreign Economic Relations and Foreign Policy. He was posted to France for eight years before becoming the Netherlands Representative in Taiwan in 2002. He fell in love with Taiwan, with its culture, its nature and its friendly people. On many of his trips he also learned about the 17th century Dutch presence at Formosa. He decided to share his traveling notes to encourage Taiwanese and foreigners to discover what it is about Taiwan that he likes so much. In 2009 his love for Taiwan deepened further. He was adopted as an elder by the Rukai Tribe in Wutai Township, and became close to the Tsou, Siraya and Puyuma tribes. 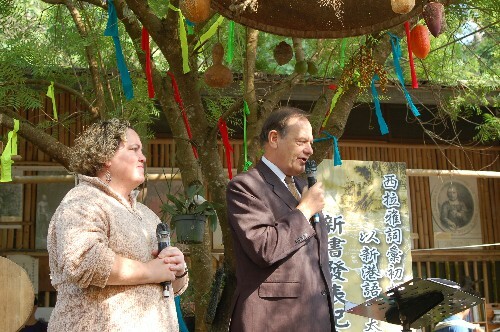 After his retirement in 2010, Menno and his wife Ingrid moved to southern Taiwan. Menno continues to research the Dutch heritage in Taiwan at National Cheng Kung University in Tainan. Cheryl Robbins earned a Bachelor’s degree in Zoology from the University of California, Davis and a Master’s degree in Cultural Management from the University of Northumbria, Newcastle, England. She is a freelance arts, culture and travel writer. Her articles have been featured in a number of publications including Taiwan News, Fountain Magazine, Travel in Taiwan Magazine and Compass Magazine. She is also the founder of Tribe-Asia Company, which works to promote Taiwan’s indigenous arts and culture internationally. She was born and raised in Los Angeles, California, and currently resides in Taichung, Taiwan. Cheryl is now working on a series of guidebooks to Taiwan’s indigenous areas to be published in 2012.